Track all your sports activities. We support videos from YouTube and Vimeo. Welcome to Workout Trainer by Skimble! Skimble's apps helps you stay healthy & fit. Join now to access 1000's of workouts and connect with our community of active people. Part of the Planet Granite chain of gyms, PG SF offers climbing and fitness classes that overlook Crissy Fields and the Golden Gate Bridge. 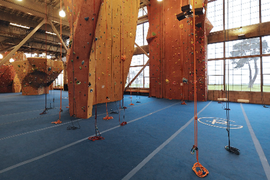 It's the newest climbing gym in the city with an extensive bouldering area.